I belong to a local ICES group and they meet once a month and usually there are a couple of demos by group members and then twice a year they have a day of sharing where they have 3 or 4 demos on anything involving sugar and a hands on demo. The last one was in October and a wonderful lady, Elena Odorizzi, who owns a local bakery supply store, Finishing Touch Bakery Specialties, was there to demo Sugar Dress. If you have not heard of it before it is pretty cool. It is like sugar veil but easier. At least that is what they say. 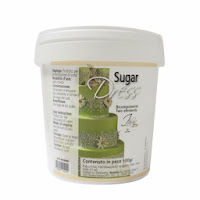 I have never tried out sugar veil but I was totally intrigued by this Sugar Dress and really how simple it was to use. Sugar Dress comes from an Italian company called Martellato. Click this Martellato link to learn more about it and this Global Sugar Art YouTube video that shows how to use it. A month later I decided to try it out and bought me a silicone matte and some Sugar Dress and went to work. It was really easy to do it works just like they said it would. You can prepare it two ways. One is just mixing it up and putting it in the mold and then letting it dry out all day long or you can set it in your oven on a low setting for ten minutes and then you put more sugar on and repeat twice. I am pretty impatient so I went for the shorter route. 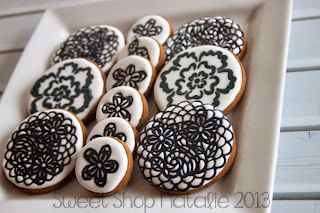 I used it on some black and white cookies I made for a event. Usually this lace is for cakes but you can use it on anything you want. And if you watch the YouTube video you can see all of its uses. This is what the mat I bought looks like. I went with this one because I thought it would work best for cookies. 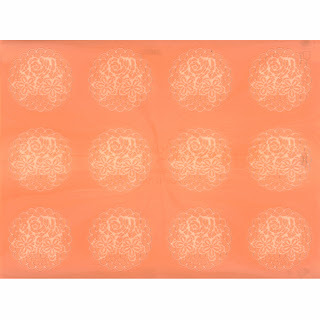 There a other mats available and you can use the SugarDress in any silicone lace mat you have. 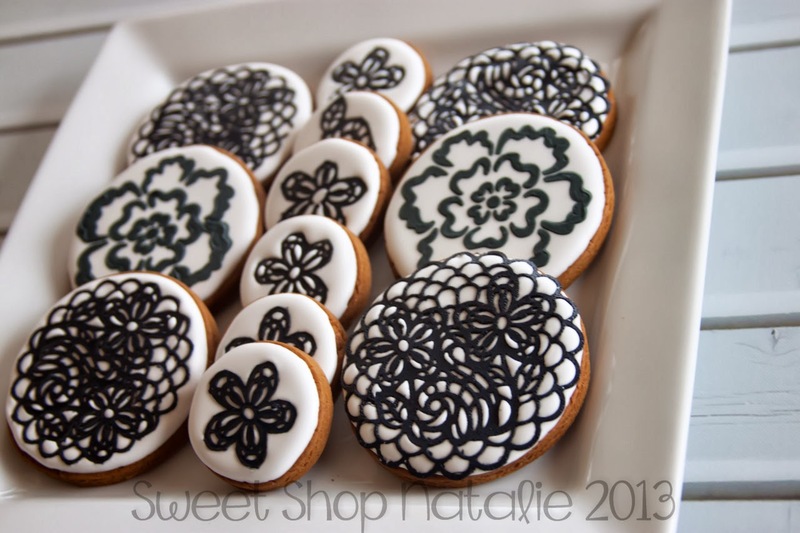 It is very flexible and is very easy to cut as you can see I cut out parts of the lace and put it on the mini cookies. It smells and taste kind of like marshmallows. You can color the lace any color you want you just add coloring gel to the paste when mixing it up. 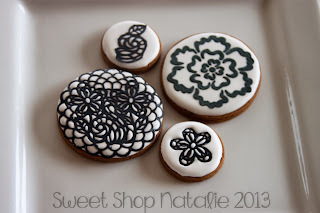 I also did a couple of stenciled cookies with this batch. Again check out Martellato or Global Sugar Art to find out more about it as well as this YouTube video by GSA.